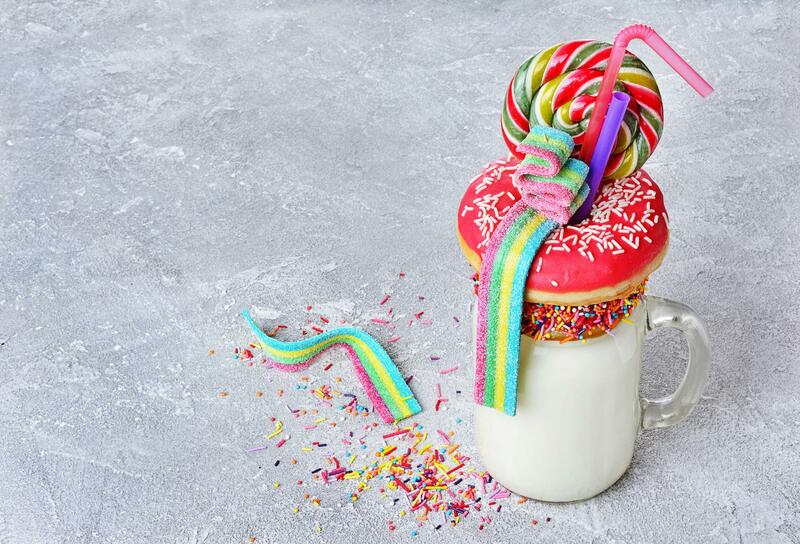 When you're craving a seriously sweet drink, only the most extreme milkshake will do! From shakes that combine donuts with lollipops to flavorful berry options, getting your frozen fix has never been more decadent. Your tastebuds will thank you when you try a tasty vanilla milkshake topped with frosted donuts. It's easy to make, and you definitely won't put it down until the last drop is gone! This makes one shake. Brush simple syrup around the mouth of a mason jar mug. Dip or roll the mug in multi colored sprinkles and set aside. Combine the ice cream, milk, vanilla flavoring, and crumbled donut in a blender and pulse until fully combined and frothy. Pour milkshake into the mug. Add a couple bright straws and then put two donuts over the straws. Fold ribbon candy accordion style and use a toothpick to attach to the top donut. Place the lollipop off to the side of the milkshake and serve. Toasted marshmallows and brownie bits take this shake to the next level. Serve it in a large mason jar mug and have plenty of napkins for the delicious concoction. The recipe makes one generous serving, but is easy to multiply for additional drinks. Blend one cup raspberries, ice cream, milk, and two tablespoons syrup. Pour into your mug. Place mini marshmallows on a parchment-lined cookie sheet in the oven on broil. Don't preheat the oven and watch the marshmallows very closely. You only want the tops to get a hint of brown. Don't let them melt. This will only take a few seconds to a minute, depending on your oven. 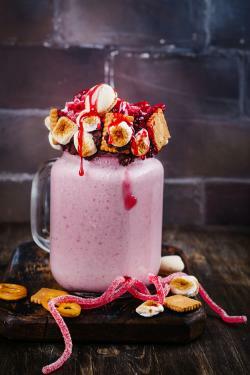 Mix the crumbled brownies, graham cracker cookies, and reserved raspberries together in a bowl, then pile on top of the milkshake. Place the warm marshmallows on the mixture. Garnish by drizzling raspberry syrup over the rest of the mixture. When nothing but chocolate will do, this shake is the one for you! The shake is bursting with chocolate and peanut butter flavors. The recipe serves one. Pour about a teaspoon of the chocolate syrup down each side of the mason jar mug and allow it to run down the sides haphazardly. You can gently roll the mug to expedite this process. Blend the ice cream, peanut butter, and milk together. Pour the shake into the mug. Use a spatula to spread a thick coat of frosting over the mug's mouth. Cover the sides and top of the mug with the crushed peanut butter cups. Add the chocolate candy bar to the mug. Put the slice of cake on a straw and put into the mug. Add a dollop of leftover frosting on the bottom of the meringue cookie to affix it to the top of the cake slice. 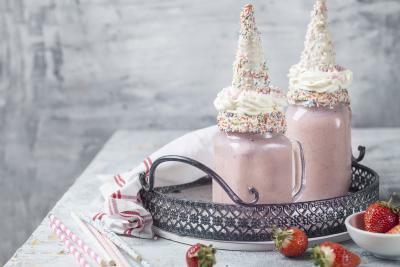 These unicorn-themed shakes are sure to make your food fantasies take flight! The original milkshake recipe makes three 12-ounce servings, but using large 16-ounce mason jars mugs allows you to enjoy a larger serving without altering the recipe. Melt white chocolate. Dip the rims of the mason jar mugs into the chocolate. Allow excess to drip off. Dip the white chocolate-covered mug mouths into sprinkles until fully covered. Set aside. Dip and roll the sugar cones in the white chocolate until coated. Gently shake to get excess off. Place the sugar cones on a cooling rack set over foil. The foil makes clean-up easy. Use a spoon to sprinkle the colored sprinkles over the cones. While the cones set, make the strawberry milkshakes according to recipe instructions. Pour milkshakes into mugs, reserving extra for seconds. Pipe whipped cream over the top of the milkshakes. Set the cones on top of the whipped cream to serve as the unicorn horns. Salted caramel with chocolate is a drool-worthy combination that will make your mouth water. This recipe makes one serving, but you can easily multiply it. Drizzle the caramel sauce around the inside of the mason jar mug mouth. It's okay if some spills to the outside. Make the chocolate caramel milkshake according to instructions, adding the sea salt before blending. 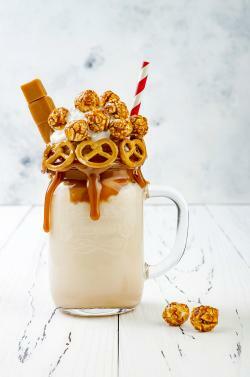 Top the shake with whipped cream and caramel corn pieces. Add a little caramel sauce to the pretzels and place around the edges of the mason jar mouth. Slide the caramel squares onto a toothpick as garnish. Sprinkle additional sea salt on top if you want to punch up the salt flavor. 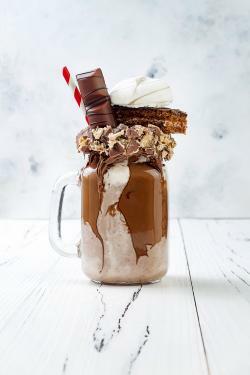 These crazy milkshakes are sometimes called freakshakes after they were made popular in Australia and spread around the world. It doesn't matter where they originated; all that matters is they satisfy your sweet tooth. Now wipe that drool off your chin and start blending!